Nashville has a new newspaper and I love it! Last month, my husband came home with a copy of the Nashville Retrospect and I thought it was one of the best ideas I’d seen in awhile. The Nashville Retrospect was just started a few months ago and each issue contains several newspaper articles from Nashville’s newspapers of past. It includes a variety of stories and pictures from old news headlines and makes for entertaining reading. As a proponent of the genealogical and historical value of old newspapers, I was ecstatic to see this paper and plan on sending off for a subscription at the beginning of the new year. Contributions to the paper come from a number of Nashville residents, a few whose names I am already familiar with. There is a nice “Contents Timeline” feature as well which displays all the stories in the issue in chronological order. There are marriage notices, death notices, interviews with elders in the community, and advertisements of all kinds. The librarian in me immediately wants to start indexing it, but alas, it is not a project I can even think of having time for right now. I wonder if there is a library in town that will? I can’t wait for my next issue! 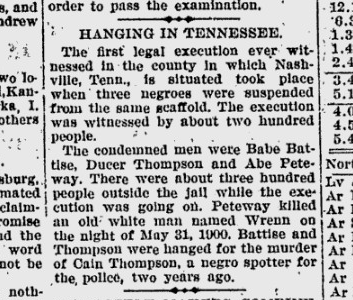 The following items are from the Afro-American Sentinel, a newspaper published in Jackson, Madison County, Tennessee. The Tennessee State Library & Archives has only one issue on microfilm – October 11, 1890. The following news items are excerpted from page 3. You must register today or lose your vote in Nov. Colored people pay your pole taxes and get a recept for the same, so you can vote in Nov.
All the books needed for Lane Institute and the public schools will be found at Harris’ Book Store. Rev. A.W. Wayman, D.D., Bishop of the diocise of Kentucky and Tennessee, will preach at the A.M.E. church Thursday night Oct. 16, ’90. Let everybody turn out and hear one among the greates preachers of the age. The Sentinel desires all its readers to send in for publication personal notes, notices of parties, and all entertainments. This is news, and we want to print the news. 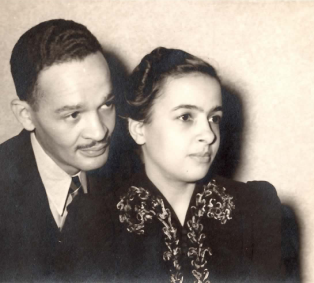 The contract for plastering Berean Baptist Church was awarded to Mr. J. Wesley Banks. West is one of our boys, he always get there. Just look how Walter Mitchel smiles, it is another little 10lb brakeman, about a week old. Mr. W.H. Day of the 10th district was in town Thursday and left his subscription for the Sentinel one year. That tells what he think of colored interprises come again. The Saw Mill, for Mose Black and ond 2 miles east was started successfully today. The builders are in the Southern Engine Works at Jackson, Tenn, all credit to them. The law compels every voter living in the city of Jackson or in the 15th civil district to register in order to vote. Today is the last day. The Sentinel must be in the hands of 2,000 readers in this town and county before January 1st. Republican candidate for Governor Louis T. Baxter, of Nashville. We call attention of our readers to the large and well selected stock of books of all kinds for sale at Harris’ Book Store, 115 Main street. The fair grounds is rapidly getting into shape. It will be a daisy. Wonder if the street car company will extend their tracts to the gates. It will be big money in their pockets if they do. There will be a Savings Bank established by the colored people of Birmingham. The colored people of Lynchburge, Va. has established dry goods store. It is conducted by Jas. Mitchell. Be sure to tell every one you see, to pay his pole tax. Let <…> pull out in November. Say boys if you are dry call around boys and see Davis and Cain, they have the stuff to wet you with, corner Shannon and Lafayette Sts. T.B. Davy of Hardin was in to see us this week. J.G. Parker, of Carrol paid the Sentinel a visit while attending the Convention. D.S. Anderson of the 12th district of Madison, gave us a call. D.W. Ellis of Denmark, gave us a plesant call Monday and left his subscription. Rev. W.M. Cowen, is in the city visiting home folks. Rr. Wash Currethers and family moved to Memphis, Tuesday, where they expect to make thier future home. F.H. Nichols, delegate from Hardin county, was in to see us. T.H. Bledsoe, delegate from Carrol county, paid us a call, and left his subscription for one year. Rev. F.M. Hamilton editor of the Christian Index left, Monday morning for a weeks stay in Atlanta. He expected to stop in Birmingham. Mr. Tom Stegall was circulating among his friends this week. B.D. Daulton, of Carrol, gave us a call. Reports Carroll as being a reliable old county. Mrs. Chilton who has been confined at her home for sometime, we are glad to note is able to be out again. She gave us a pleasant call Thursday morning. Mrs. Sarah J. West and Mrs. Maria Austin gave the Sentinel a very pleasant call and left their subbscription. Thanks. Call again ladies. Miss Laura B. Thomas is confined to her bed, but is better this week. J.M. Cooper of Henderson county was in to see us Tuesday. He gave a good report of the colored people. Mrs. Nannie Miller has returned from Canada where she was visiting relatives at her former home. 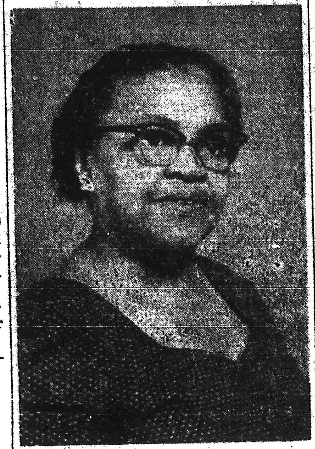 Miss Mamie Parker a handsone young lady; who has been attending Lane Institute, will leave Saturday for Fulton. Miss Bell Moore will accompany her.